From the specimen here given it is sufficiently manifest, that the whole cabinet of a Virtuoso and collector of old China might be depicted on paper in little more time than it would take him to make a written inventory describing it in the usual way. The more strange and fantastic the forms of his old teapots, the more advantage in having their pictures given instead of their descriptions. And should a thief afterwards purloin the treasures if the mute testimony of the picture were to be produced against him in court it would certainly be evidence of a novel kind; but what the judge and jury might say to it, is a matter which I leave to the speculation of those who possess legal acumen. 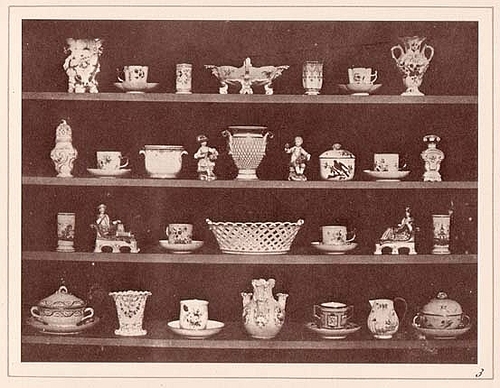 The articles represented on this plate are numerous: but, however numerous the objects however complicated the arrangement the Camera depicts them all at once. It may be said to make a picture of whatever it sees. The object glass is the eye of the instrument the sensitive paper may be compared to the retina. And, the eye should not have too large a pupil: that is to say, the glass should be diminished by placing a screen or diaphragm before it, having a small circular hole, through which alone the rays of light may pass. When the eye of the instrument is made to look at the objects through this contracted aperture, the resulting image is much more sharp and correct. But it takes a longer time to impress itself upon the paper, because, in proportion as the aperture is contracted, fewer rays enter the instrument from the surrounding objects, and consequently fewer fall upon each part of the paper.